Spread Firefox with Foxkeh, a cute mascot born in Japan! Unfortunately we will temporarily stop updating Foxkeh.com. * "カレンダー付き (日曜始まり・休日表示あり)" means "With calendar starts on Sundays, Japanese National Holidays indicated"
* "カレンダー付き (日曜始まり・休日表示なし)" means "With calendar starts on Sundays, no holidays indicated"
* "カレンダー付き (月曜始まり・休日表示なし)" means "With calendar starts on Mondays, no holidays indicated"
* "カレンダーなし" means "Without calendar"
Sorry for any inconvenience, and thank you again for your continuous support for Firefox and Foxkeh! We're already halfway into October, so please let us apologize for the delayed note. 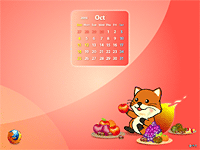 Foxkeh's October wallpaper is now available. This month, Foxkeh is feasting on some fall fruits and may have eaten a bit more than he should have. If Foxkeh gets too fat, he'll start looking like a racoon! Foxkeh, please don't eat too much =^_^=. Foxkeh, who was born on September 1st, 2006, is now 3 years old! 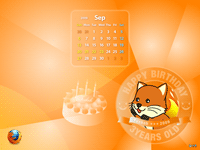 Before we even knew it, Foxkeh had 32 wallpapers created for him, and this 33rd wallpaper celebrates Foxkeh's third birthday. Please remember, as long as you are not using Foxkeh for commercial profit, and you credit Mozilla, you're free to use Foxkeh in your own way. The design of Foxkeh seems pretty simple at first, but to draw Foxkeh yourself is harder than it looks. The staff of Mozilla Japan tried to draw Foxkeh but he ended up looking like a cat or a dog, not like the red panda that he is. If you are drawing your own Foxkeh, please feel free to use the Foxkeh images and body parts that are distributed on the download page. Happy birthday to Foxkeh and thank you to everyone who loves him and shares him with your friends and family. Foxkeh appreciates your love. As a mascot of Mozilla Japan, Foxkeh supports our promotional campaign for Firefox in Japan. Foxkeh wants to know more about Firefox and is happy to meet you! Explore the roots of Firefox and Mozilla back to the early Web era, 1993. Browse in the fast lane: upgrade to the fastest, safest and smartest Firefox yet. Copyright © 2006-2011 Mozilla Japan. All rights reserved. Some contents are licensed under the Creative Commons. Refer to the explanation of each content for details. Mozilla, Firefox and Firefox logo are trademarks or registered trademarks of the Mozilla Foundation in the U.S. and other countries. Other company names and product names are trademarks or registered trademarks of their respective companies.